WHEN you go on holiday the first things you want to do are dump your bags in the hotel, explore and go for a drink. Luckily, in a city where a pint still costs £2, this is no problem — but there’s a chance you could be interrupted by a couple of film stars, depending on where you stay. Our home-away-from-home in Prague — following in the footsteps of Angelina Jolie, James McAvoy and Liam Neeson — was the sleek, glass-fronted Andel’s Hotel, used in Hollywood movies Wanted and The Chronicles Of Narnia: Prince Caspian. But we didn’t hang around too long hoping to spot a celebrity. After all, the Czech Republic’s capital is Europe’s fairytale city. First we headed to the imposing Prague Castle — home to kings, emperors and presidents for more than 1,100 years. Then it was on to Wenceslas Square. Just 25 years ago, thousands of students occupied this main drag — now home to boutique shops, restaurants, bars and hotels — and overthrew communism. How times have changed. A quick stroll across the iconic Charles Bridge, marked with tall, dark statues on either side and bathed in the deep yellow lights of the castle, then led us through cobbled streets to Old Town Square. Boasting the enchanting astronomical clock, and lying at the foot of Tyn Church and its jet-black spires — said to have inspired Disney’s famous castle — this is the living heart of Prague. Famed for glorious winter markets, you might assume life would slow down here when the weather warms up. Hardly. You can still get the delicious trdelník — pastry rolled over a flame and sprinkled with sugar — and langos, a particularly calorific “snack” of deep-fried flat bread covered in cheese and, in my case, lashings of ketchup. But if fine dining is more your thing, look no further than Mlynec, one of the city’s top restaurants, overlooking the Vltava River. Prague, of course, is rather like London — it doesn’t need to sell itself. The city’s magical atmosphere and fascinating history have huge pulling power. But of the rest of the Czech Republic I knew almost nothing. So, being a fearless traveller, I packed my bags and barely an hour down the road found Pilsen, a modest city of 170,000 people that will be 2015 European Capital of Culture. But for now, the city has a thriving culture of a different kind — a drinking culture. It is based around Pilsner Urquell, the brewery where lager as we know it was born in 1842. A tour of the famous brewery is a must, and includes a tasting session in the underground vaults where barrels that store the precious liquid are kept. Like Prague, Pilsen’s centre lies in the shadow of a cathedral, the 338ft St Bartholomew — the country’s tallest church. With the quiet, cobbled streets bereft of umbrella-wielding tour guides, we were able to tour at our leisure the huge Republic Square, which that day played host to a craft and food market. Before we left, our guide led us back to the cathedral, where small golden angels guard the front gate, and invited us to touch the solitary silver bust. Doing so, we were told, would make our dreams come true. With Prague the tourist capital and Pilsner the culture capital almost within touching distance — and accessible by a host of budget airlines — this is a two-for-one deal you really can’t be cynical about. I call that Czech mate. 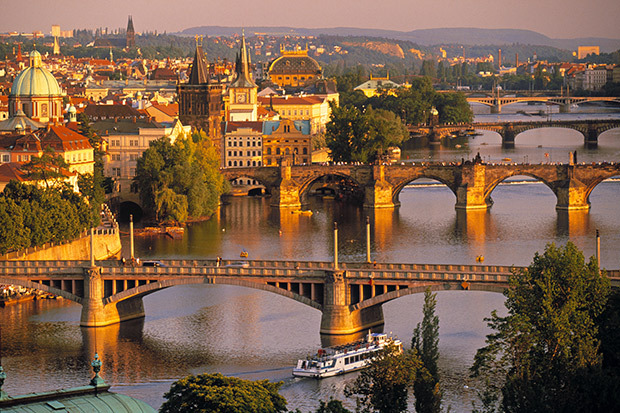 GETTING THERE: easyJet flies to Prague from Gatwick from £73 return. See easyjet.com. STAYING THERE: Double rooms at Andel’s Hotel Prague with breakfast from £37 per person. Double at Angelo Hotel Pilsen from £34. See vi-hotels.com. MORE INFO: You can log on to praguewelcome.cz and czechtourism.com. Originally published in The Sun on Sunday April 20 2014.